Historically, Pour Un Homme de Caron was the first fragrance marketed towards men. Since then it has endured 84 years and is still available today despite being a lesser-known fragrance. Given its historical contribution to the perfume industry, it deserves a full review. We’ll be evaluating this fragrance based on the blend, the seasonality as well as its strength and value for money. At the turn of the 20th Century, men’s fragrances were limited in choosing either unisex eau de cologne or English lavenders. Whilst there were fragrances that were deemed typically masculine, perfumers didn’t necessarily market their concoctions for a specific gender. Caron founder, Ernest Daltroff, endeavoured to create the first perfume that was designed specifically for men. Pour Un Homme de Caron was released in 1934 based on a simple yet effective lavender and vanilla accord over a woody and amber base. Lavender was Daltroff’s favourite note while his associate, Félicie Wanpouille, was fond of vanilla. Daltroff was in love with Wanpouille and therefore sought to merge the two. They married sometime after before Daltroff, a Polish jew, fled Occupied France for the USA. After the war ended, Pour Un Homme de Caron became an iconic fragrance both domestically and abroad. It was worn by French stars and politicians including Serge Gainsbourg, Jonny Hallyday, François Mitterrand and Nicolas Sarkozy. However, it was a known favourite of James Dean. Today, Caron continues to produce and sells its perfumes independently. In 2014, it released 300 limited edition bottles made from Baccarat crystal set in a silver plate with a sharkskin cap. Although Caron was first designed as an Oriental Aromatic, its properties today are closer to a traditional aromatic fougère. With no vintage blends to compare with, it’s uncertain whether this is due to evolving families or reformulations. That said, Romain Alés, Caron’s current CEO, has stated that both the bottle and its contents has never been altered since its release. Therefore, we can safely assume that the olfactive family is different due to external developments. Pour Un Homme opens on a crisp head featuring mild bergamot and an aromatic bouquet of rosemary and lavender. Being one of the blend’s main notes, the lavender is particularly overt. However, persisted smelling will pick out the other notes that provide substance to the head. As an opening, the head is refreshing yet mild with unconventional properties for a modern man’s fragrance. As the bergamot and lavender notes subside, it reveals the fragrance’s heart. Here, we can detect the gourmand vanilla with accompanying sage and sandalwood notes. The lavender persists throughout the heart in order to create the celebrated accord with the vanilla note. In spite of its simplicity, the bouquet is complex and tantalising. Evocative of a spring morning as the sun touches the dewy greenery, it’s quite breathtaking and a unique experience. Meanwhile, the clary sage and sandalwood notes are mild yet create depth behind the lavender and vanilla. Despite entering the base, the vanilla and lavender continue to interact for a fully accorded experience. As the clary sage and sandalwood begin to evaporate, oak moss and tonka bean work together to great an accord reminiscent of freshly-cut grass. Its sweet essence blends well with the lavender and vanilla whilst a faint note of musk creates a deep and alluring amber. With its structured blend and numerous accords, Pour Un Homme features an intuitive life-cycle. A refreshing opening slowly transitions towards a sweet and heady base that is evocative of elegant and traditional fragrances. Caron’s sillage is prominent and leaves an alluring trail behind the wearer. However, the projection is tight and concentrated. Bystanders would only catch a faint whiff but those who come intimately closer would enjoy the complex blend in greater detail. Its subtle elegance isn’t long-lasting, though. Although far from fleeting, the longevity endures but a few hours and would require being re-applied during the day. Do People Like Pour Un Homme de Caron? During testing, no-one disliked Caron but it appeared to be something of an acquired taste. Interestingly, it appeared most popular among women not solely as something that they would wear but a fragrance they’d find attractive on a man. The lavender notes received the most comments and those who picked up on the vanilla seemed to love it. As Pour Un Homme is starkly different from a typical contemporary masculine fragrance, men seemed somewhat unsure. Lacking either the powerful headiness found in fragrances such as Aramis or resinous woodiness of either 1 Million and Dunhill Icon, some found it too delicate for their tastes. 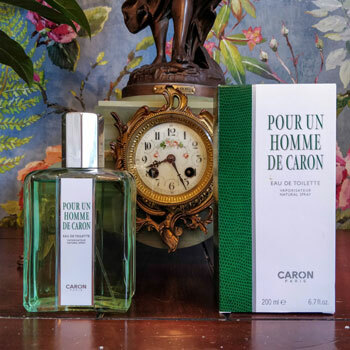 Indeed, Pour Un Homme de Caron is far from masculine by today’s standards and may be seen as something of an oddity. As mentioned earlier, before its release over 80 years ago, men would wear much fainter eau de colognes or English lavender. Pour Un Homme was an extension of these by adding complex notes and accords that were usually reserved for feminine fragrances. Alternatively, Dunhill for Men was released in the same year. This was more of a precursor to modern masculine fragrances with a rich leather and resinous woody base. However, each offers a contrasting interpretation of masculine perfumery by going in completely different directions. When Should You Wear Pour Un Homme De Caron? With its deeply aromatic notes, Pour Un Homme de Caron is a decisively spring fragrance, which works well in the summer too. The overall accords are deeply evocative of warm sunny mornings and it would be hard to imagine this worn during the winter. As for the age range most suited to this fragrance, it’s a very refined and ornate blend. Therefore, it’s not something that would be easily worn by younger men. Instead, this is something best worn by older men approaching their forties. Nevertheless, it’s hard to pinpoint an exact time of day for wearing Caron. Whilst it would be perfect during the day, it might also be just as effective in the evening or at night. Therefore, we’d say this is a versatile all-day fragrance depending on the occasion. Similarly, Pour Un Homme could potentially be worn during any occasion. The simple accord of lavender and musk would work well casually. Meanwhile, its reassuring composition would be suitable for the workplace. Yet given that it’s a complex blend too, you could likely wear it at more formal gatherings. However, we would say that it’s most effective for romantic encounters. Both lavender and vanilla are recognised as aromatherapy treatments, which also seems to be effective in this scenario. 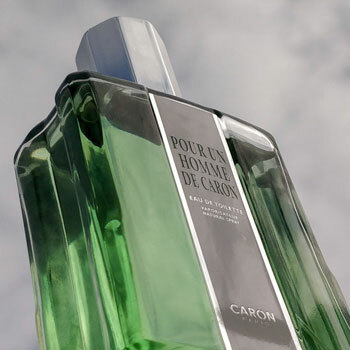 Whilst Pour Un Homme de Caron isn’t sexually seductive, it’s highly therapeutic. Instead of wearing a brash and intoxicating scent, more considerate men could consider this alternative, which is particularly reassuring and comforting. Those fond of fragrances by either Creed or Penhaligon’s would appreciate Caron’s refined and reassuringly secutive. The overall blend only features but a few typically masculine notes by today’s standards. In fact, its alluring transitions would be fitting even for a woman’s fragrance despite its delicately masculine structure. Therefore, this is a fragrance that is almost unisex in nature. Pour Un Homme de Caron still features the same bottle that was designed by Wanpouille and Michel Morsetti back in 1934. As mentioned earlier, Caron has stated that it will respect the fragrance’s heritage and not sway by changing this. Indeed, the bottle is strongly reminiscent of Art Deco design with an angular cap and bevelled edges. In this review, we tested a 200 ml (6.7 Oz) bottle, which despite its size, felt ergonomic and comfortable to hold. Whilst the bottle’s design is indeed classic and evocative of its era, it’s a shame that a premium fragrance would have a plastic cap. Similarly, the text on the front of the bottle is in the form of a sticker, which feels something of a shame. Overall, the atomiser performs very well but it appeared that when removing the cap, it would cause the base to ride up. Before using the atomiser, this would need pushing down to prevent the fragrance spraying inside it. As for the packaging, it’s both classic and attractive. One white side features the fragrance name and brand whilst the other is a green snakeskin leather effect, which are separated by a silver band. Finally, the Caron’s pricing can greatly oscillate. On Amazon, 100 ml (4.2 Oz) fetches for anything between $90 to $200 depending on the seller. Meanwhile, Notino tend to offer this at a much more reasonable price. However, since Notino is currently down and transitioning to an international site, it’s hard to check the current price. Nevertheless, for a classic fragrance that hasn’t changed since its conception, it does offer great value for money when paying no more than $90 for 100ml. Pour Un Homme de Caron may not be a typical masculine fragrance by today’s standards. However, this is what makes it so unique. Compared to the more common overbearing and brash masculine fragrances, Caron is a refreshing alternative. Furthermore, it’s one of our favourites that yielded excellent BUFF results. Therefore, it’s also featured as one of the best fragrances of all time. Its simple accord offers a complex experience, which is soothing for both for the wearer and his or her entourage. For those looking seeking a refined signature scent that evokes a little extra class, Pour Un Homme de Caron achieves just that. Given its heritage and historical background, Pour Un Homme de Caron is a must for any serious fragrance collector’s stash. Reviewed by Charles-Philippe Bowles, on 5 March 2018 . "Subtle and understated for the elegant gentleman. Representing an important moment in history, Pour Un Homme de Caron is still one of the most refined fragrances for those seeking something special." Interesting. I didn’t realise that men’s fragrances started as late as the thirties… What about these fragrances from Creed and Penhaligon’s that have been around since the 19th century but are for men? That’s where it gets interesting and leads to a lot of confusion. A lot of these older and more traditional fragrances were unisex at the time of their release. However, they’ve since been rebranded and marketed towards genders in order to make them more adapted to current trends. Sometimes, they even go as far as slightly reformulating them to make them more appropriate for the targeted gender. This is such an underrated fragrance. It’s timeless and seems to always remain relevant compared to contemporary fragrances. I completely agree. It’s amazing how this simple accord manages to always stay fresh despite being a tried and tested blend! Not the first for men, Worth Pour Homme was launched in 1932, two years before Caron! Wow, this is a very interesting titbit, thank you! I hadn’t heard about Worth until you mentioned it. I just read up on their history and it sounds like they were significantly ahead of their time. They were one of the first fashion houses to brand into perfume and that was in 1924! They certainly deserve a review and a little more research. Dear Sir, I’m just glad, I could point you to that direction. Scented Christmas Greetings from Finland. Yours, H.M. It was much appreciated. Season’s greetings to you too from France and the USA!